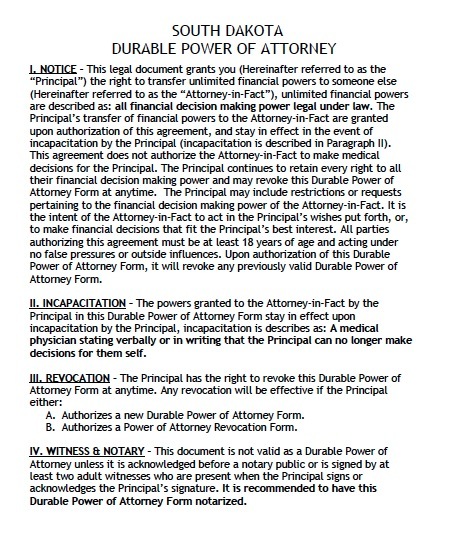 The financial power of attorney is a powerful legal tool that authorizes the agent to exercise sweeping power over your financial affairs. In South Dakota, the general form authorizes the agent to act for you regarding the following subjects: real and personal property, banking transactions, stock and bond transactions, managing retirement plans, preparing taxes, and other actions the principal would otherwise have the power to do. This ability can be useful for someone who is going overseas for an extended period, for someone who can no longer manage routine financial matters, or for someone who has to attend to more substantial issues than mundane financial matters. Two problems associated with powers of attorney are picking an untrustworthy agent and granting unnecessarily broad powers. Thus, it is important to carefully consider who to pick and only grant powers you think are necessary.